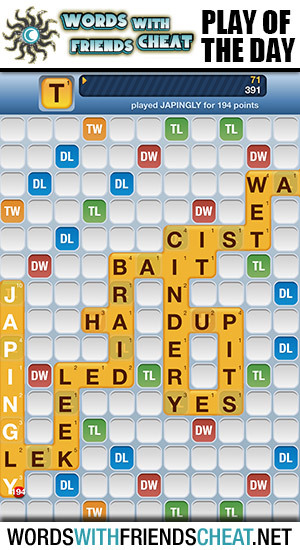 Today’s Words With Friends – Play Of The Day is JAPINGLY (194pts) and was submitted by Words With Friends Cheat user Steve. Once again the power of the edge swoops in, securing a tremendous lead. By Laying his tiles on a pair of triple letters and a triple word, Steve added one hundred ninety-four mind blowing points to his total.